Learning to paint has been a hugely rewarding process for me. I hear so many people tell me they could never paint because they are not creative. Not true! All it takes is a willingness to try and the confidence to believe that you are capable. I created two classes that are a great introduction to painting botanicals and florals with watercolor. They both describe all the supplies you’ll need and are incredibly beginner friendly! I talk about, and show through several demonstrations, how to take advantage of your brush to create beautiful, organic shapes without needing to know how to draw. Using the links below, you can get 2 MONTHS FREE access to my classes and hundreds of other creative people’s classes with NO COMMITMENT, you can cancel anytime. So start today! We all have a beginning to our story, and today could be yours. I truly believe that every person is creative if they give themselves the chance to try. This creative exercise is the perfect way to ease into the loose and abstract style of watercolor that make it so unique and so rewarding for both beginners and experts alike. You don’t need to be great at drawing and you don’t need several hours. This class will show you a simple way to take just a few minutes to loosen up your watercolor style and let the brush and the paint do the work. My goal is to make sitting down to paint with watercolor a low pressure, experimental, and enjoyable environment. Join me today and expand your creative practice while discovering the beauty of watercolor! Florals are one of my favorite things to paint using watercolor! 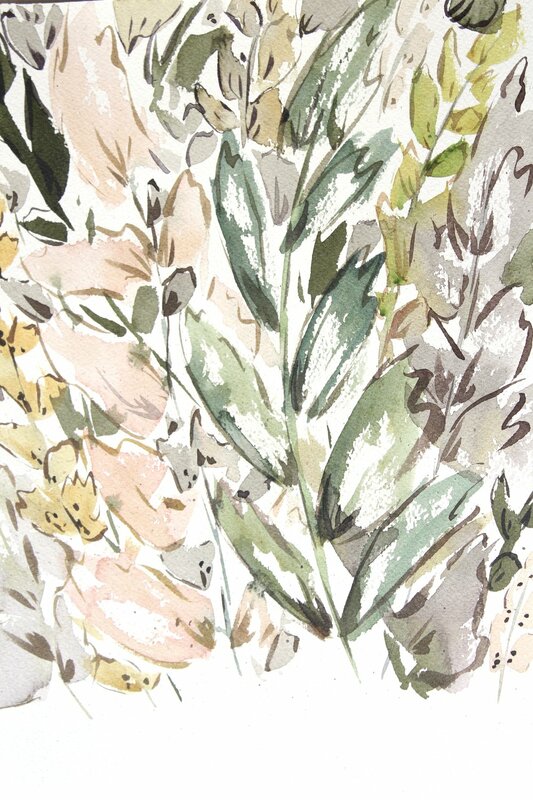 The loose and abstract capabilities of watercolor allow you to create lively florals with beautiful color gradation. We’ll start by learning some basic brushstrokes, then we’ll put those to use as we practice several different floral shapes. Then I'll teach you how adding details to your florals can really make them pop! We’ll finish it off by combining all of our new floral skills into one beautiful floral painting! As a bonus, I include a second full painting demonstration! I truly believe that every person is creative if they give themselves the chance to try. This creative exercise is the perfect way to ease into the loose and abstract style of watercolor that makes it so unique and so rewarding for both beginners and experts alike. This class is completely approachable for beginners but also offers several new insights for more seasoned artists. This style of floral painting is incredibly relaxing and so rewarding when you see what beautiful colors and shapes you are capable of creating! Discover why your creativity might be feeling off and bring back the joy that attracted you to creativity in the first place! Creativity is meant to be energizing, fun, fulfilling, relaxing, rewarding, and wonderful! But have you ever experienced a slump in your creativity? Have you felt a little stuck, discouraged, distracted, frustrated, overwhelmed, impatient, exhausted, or any number of other negative feelings while trying to create? If so, this class is for you! You are not alone, I’ve been there, and I am here to help. Think of this as a gentle but practical pep talk to kick your creativity back into gear. Each lesson is filled with motivation, inspiration, and tons of actionable tips and tricks to overcome these common stumbling blocks and ultimately achieve a flourishing creative practice. Want a preview? Some of this content is available in written form! Go to the blog to read and feel inspired!